Lady Bedford's Tea Parlour in Pinehurst, North Carolina is a unique change of pace when looking for a special breakfast, relaxing lunch or elegant afternoon tea. Come dine in a Victorian atmosphere with crystal, fine china, linen table cloths and napkins. There are over 60 high quality loose leaf teas to choose from, individually brewed at the time of your order. We offer a wonderful selection of daily soups, sandwiches, salads, scones with lemon curd, Devonshire cream and fruit preserves, savories and desserts that are sure to please the palette. 4 pm. Reservations are highly recommended. Lady Bedford's is happy to handle your special event. See our Party Planning Tab. For information call (910) 255-0100, email us at [email protected] or stop in at 21 Chinquapin Road, Pinehurst, North Carolina, 28374. Reviews can be read or posted at teamap.com, teaguide.net, tripadvisor.com or on our Review Tab. Lady Bedford's Tea Parlor is a Victorian style tea parlor located in the historic village of Pinehurst, North Carolina. We serve a variety of teas from around the world along with satisfying and delicious food prepared by our Executive Chef, Joseph Henderson. 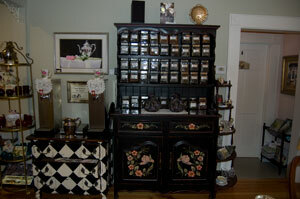 Come join us for a cup of tea and some southern charm, Victorian style!